Sunday 6th January: My seventh season of this thing called minigolf gets underway with a dash to the south coast and the home of minigolf, Hastings. I�m well rested after two weeks off work and even though I set off long before dawn breaks, life isn�t too bad. I was interested to see what changed had occurred since I had last visited with rumours circulating that new felt had been laid and what effect it would have on my notes. Today�s competition is the Cup Cake Classic, one of the three Kent invitational events throughout the season. Terry Exall is the defending champion and returning the trophy on its last legs. It had fallen apart as he took it home and was still looking sorry for itself. Despite not playing on the Pirate course, I have a knock around it as most of the alterations have taken place here. We will be playing the British Open in September, so I�d like to have a heads up. Back to the Cup Cake, we will play a round on the Crazy, one on the Adventure and back to finish on the Crazy. For me, playing on Adventure is a bonus. I�m one of the few who have spent time mapping it. 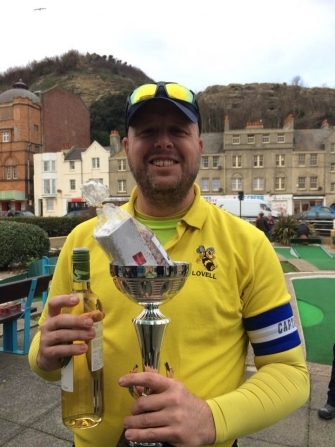 My playing partners for the opening two rounds are Terry and local Steve Colwell, who revealed he was unknowingly signed up for last year�s World Crazy Golf Championships. Always the best preparation for a world title. This year, I�ve set charity targets in memory of my mum. Five pence per ace and two pence for any other hole in one scored by anyone else. I�m delighted others have committed to this too with their own arrangements. I�m quite conscious of focussing on getting as many as I can. It isn�t my best round but 37 leaves me in fifth, five shots back from current World Crazy Golf Champion, Marc Chapman. However, my time was about to come. The Adventure course is always the toughest to post a score. We simply don�t play it. I have notes for it but even they don�t mean much when obstacles have been removed so I had to manufacture a few shots. Starting on the fourth, I look to just string two�s together with the belief if I put enough balls in the right spot, some will drop. I take a three at the ninth but from then on, I get hot. Five aces later and bagging a sensational 32, I return to the hut to find out I�ve set a new course record. All those years, all those rounds, I now have the lowest of all time. 2019 is already going well. From being five behind, I�m now three ahead with the all balls in play round to go, which means anything could happen still. I�m with Marc and Terry, my philosophy being stay out of trouble. This goes to pot at the first as I slightly overhit my tee shot, blocking Marc�s ball. Marc sends my ball back to the tee and I drop a shot. It doesn�t improve on hole two when a lip out gives me a four and a share of the lead. A few moments later, I�m back to leading by two with an ace. My progress from there is steady with a one at the ninth. I start to feel confidence flow through my clubhead and despite an inconsistent finish, it�s enough to get me over the line. I thank everyone for their kind words in recent times and announce that people have raised around �1400 for charity in mum�s name. I receive the wobbly trophy which promptly falls apart as I reach the car. I bet Jordan Spieth doesn�t have to reach for a socket set and spanners when he wins a prize. Life on the British tour, eh? Sunday 20th January: Scouring the meteorological websites suggest a mild spell so I hit up my local course in Peterborough. It�s a great place to just unwind and catch up with the course owner, Roger. His family has been massive supporters of me since I�ve known them and I show him the trophy I won a fortnight earlier. I finalise some details about my tournament in September and just work on pace of putts. Peterborough can be very unforgiving and, in my opinion, has the toughest three closing course of any I have played. Part of me being there involves chatting with customers if they ask questions. I get great joy in spreading the gospel. Saturday 26th January: On the road again, this time to the heart of Rugby League country and a new course for me in Castleford. With a journey of just under two hours, I get to the Xscape complex. It�s absolutely breath taking. As well as the Volcano Falls minigolf set up, which has two courses, there is a Glow In The Dark golf, a dry ski slope, cinema screens, trampoline park, wall climbing, laser quest, escape rooms and virtual reality, supplemented well with plenty of places to eat and drink. I�ve seen some great set ups, like Star City and Dundrum, but this trumps the lot. Unsurprisingly, it will attract a lot of people, so I�ve had to get out of bed early to get a spot on the felt. With a crowd already gathering, it is going to have to be a steep learning curve but I�m in good hands with Leeds based Henri, who is also going to be my accommodation for the evening. In relative terms, Henri is still a comparative novice, but you always trust local knowledge. The course notes are good and with a slight tweaking here and there, I feel like can be at least challenging. The duty manager, Sean, tells me that the thirteenth hole has never been aced before, so I set about trying to prove him wrong. I must have had over eighty attempts with no luck. This includes a lip out and several brushes with glory. I promise not to leave Yorkshire until I complete the task. I have to be back at work 7 am, Monday morning. After a couple of rounds with Henri, which I score 34 and 33, we have a break for food and make a decision as to whether we�ll play again today. After a foot-long sub and a packet of cookies, just one look at the queue out of the door tells us it�s practice over. I�m now glad I was up at dawn. We head back to Henri�s in the suburbs of northern Leeds and I get shown to my penthouse suite. It�s one of the best rooms I�ve ever stayed in. I drop off to sleep for a couple of hours before Henri�s mum feeds me soup and meatballs. My favourite part of the hospitality is noticing a classic 1960�s GPO rotary dial telephone. And it is still in working condition. That�s my unabashed excitement for the weekend. Alex arrives and we hit a couple of pubs, one of them an absolute world class effort. There are decent pubs north of Doncaster, you just have to look for them. Sunday 27th January: Due to the course allowing us limited use of the complex, we�re in by 8 am, via a stop for food. I had woken up during the night due to shots I believed would work better than what I tried. I try them out. The seventh, great success. The eighth, well the thought was there. I give the thirteenth some attention again, wanting to break the ice with an ace. After a cruel lip out, I decide to have two final tries before calling it a day. With the waft of my trusty wand and with attempts now in the hundreds, I finally find the bottom of the cup, breaking the silence with a roar. �I can leave Yorkshire now,� I exclaim. Being an invitational outside of the traditional south east base was never going to attract many but the nine of us will still have fun. Henri is my playing partner for the first two rounds, which we play back to back. My new shot in seven is good for the ace but an aggressive approach at nine costs me one. However, not to be downbeat, I fight for everything, saving three shots from off plateaus and some solid form near the end of the round gives me a 32, one off the lead from Michael. Henri is one back from me. Round two is brisk but without too much doing, although Henri is playing very well. Only the pipe hole at the last means I get under par while my partner hits a 31. Michael breaks the course record with a barely believable 26. We�re scratching our heads as to how that�s even possible.